The card is on a Pumpkin Pie base, the stripes on the white layer are made using the masking tape technique in Crumb Cake and Soft Suede. The leaves are die cut with the Autumn Accents Bigz Die and the Big Shot, then stamped with the Wonderfall stamp set in Cajun Craze, Crushed Curry, Early Espresso and Soft Suede. 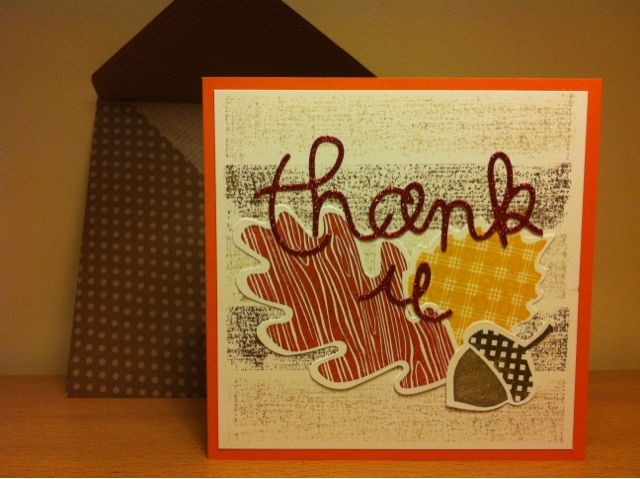 The thank u is cut with the Expressions Thinlits in Red Glimmer Paper (cut down from the word Thankful). 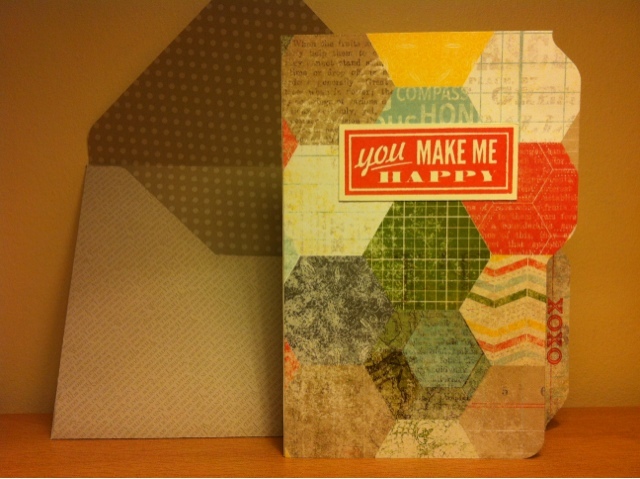 We glued the hexagon pattern of Epic Day Designer Series Paper onto the card front and the lined paper pattern to the edge of the inside, then we used the punch on the punch board to get the curved shape for the file folder tabs (like in the video from this post). To finish the card we stamped you make me happy from Hello Lovely in Calypso Coral and mounted it on the front, and we stamped XOXO from Oh, Goodie!, also in Calypso Coral on the tab. Cute!! Stamping with friends is so much fun, do you have someone to stamp with? You are always welcome to come and join us!